Have you ever been ashamed of playing a game you know is bad? I’ll probably be playing a bunch of things this weekend. I’m working my way through Professor Layton Vs. Phoenix Wright, which I’ve found to be flawed but charming. There’s always the chance that I get together with friends for some Mario Tennis action (but I talked enough about that last week). There’s one other game that, regrettably, I know I’ll be playing, and as much as it pains me to say it, that’s WWE SuperCard. That’s all well and good, right? The problem, though, is the “game” part. Once in a match, you’ll be given some parameter, such as “Solo match—toughness,” and you choose your muscle dude with the highest toughness stat. If he’s tougher than your opponent’s candidate, you win the round. The player to take two rounds wins the match. 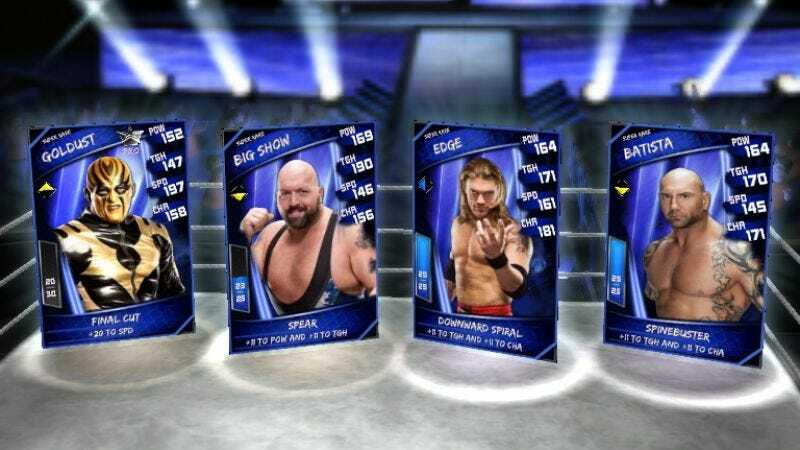 There are also some item cards—like steel chairs and trash cans—you can use to modify a card’s stats and sometimes you have to nominate two guys for a tag team. That’s it. There’s little to no strategy that goes into it, and even if you lose, all that happens is that you get to pick one less new card to add to your collection after the match. The matches only last for 40 seconds. They’re like potato chips. You pop the first and think to yourself, “Hey, what’s one more?” Eventually, you’re pulling up nothing but crumbs. As a wrestling fan, I did find some thrill in getting new cards. I want my favorites to turn up. (I ended every match by chanting “Please be a super-rare Cesaro,” until finally the Swiss Superman was mine.) Thanks to the free-to-play structure of it, though, that phase of the game doesn’t last long. After a couple hundred wins, you settle into a rut, turning up crappy card after crappy card unless you go and spend some real money for the good stuff. At this point, SuperCard less resembles a card game than a Pokémon-style role-playing game. The only use there is for the low-tier cards that you receive after each battle is to feed them to your stars, helping them to level-up and increase their stats. The cards that you’re collecting are nothing more than oiled up, muscle-bound experience points, and the game has become nothing but an endless grind. It’s vapid and manipulative and I’ve found myself embarrassingly glued to it for the past two weeks. I’ve cooled off on it, but I was approaching rock bottom (pun very much intended). I didn’t just pull it out when I was waiting in line at the grocery store or sitting on the toilet. At one point, I was sneaking in matches at a wedding reception, jamming on my iPhone’s sleep button to hide my shame when anyone came near. I’m out of the closet as a wrestling aficionado, so that’s not the issue. I’m just embarrassed to be dumping so much time and attention into something I know is so shallow and devious. So Gameologicians, in addition to our usual Friday topic, I’d like to hear if you have any games you’re ashamed of playing. You’ve all heard my confession. Now, let’s hear yours.